25 Years ago on this day the Lux Radio Theatre aired the “Crossroads” play. 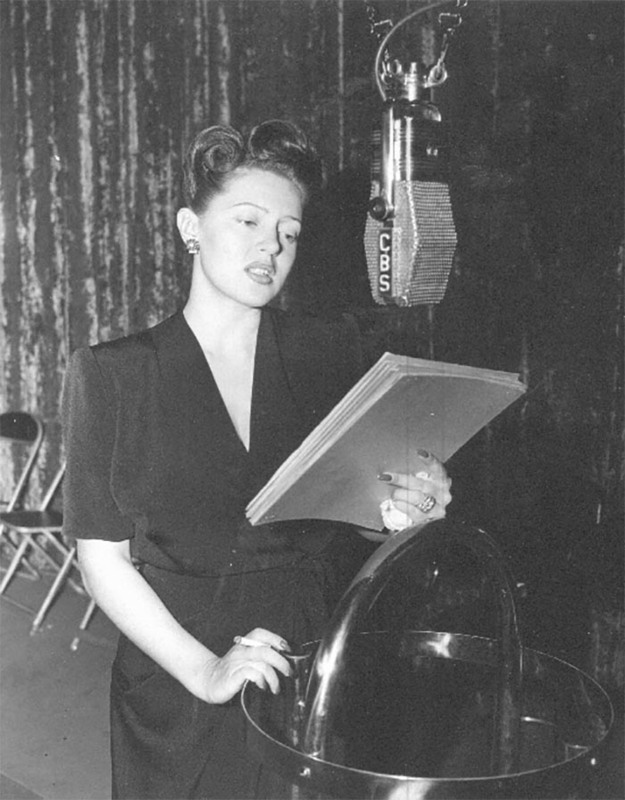 The Lux Radio Theatre was one of the most popular radio shows of the 1940s. The great Cecil B. DeMille was the host of the show. Lux Radio Theatre recreated radio versions of popular movies. Usually they used the same stars as in the film but Hedy Lamarr was not available that night so MGM substituted Lana to play her role. Lana has dark hair here because she stopped dying it during her pregnancy. Cheryl was born four months later. 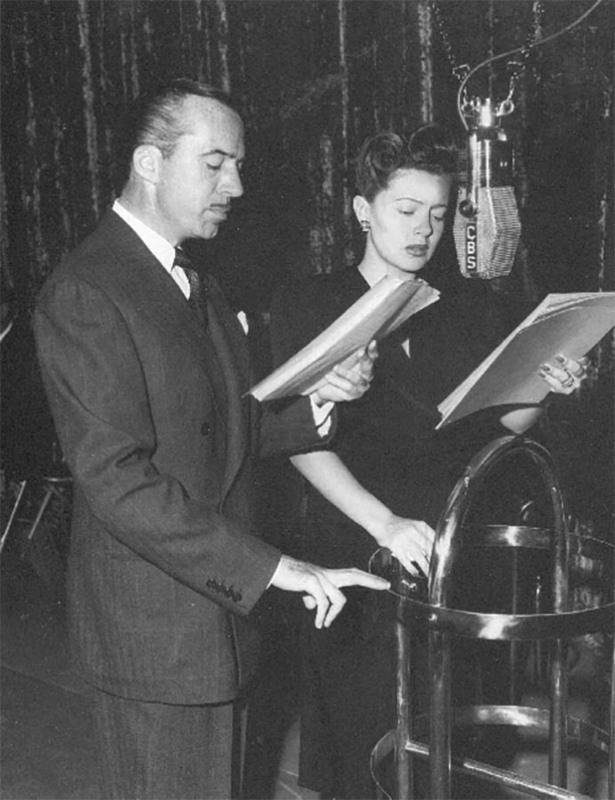 Her co-stars are William Powell (in photo with her) and Jean-Pierre Aumont. Working titles of the film were “The Man Who Lost His Way, ‘Til You Return” and “The Man from Martinique”. Although Ralph Winters was announced as the film’s editor in a 25th of Febr. 1942 Hollywood Reporter news item, he is not mentioned in any other source. “Crossroads” was based on the screenplay for a 1938 French film, “Carrefour”, directed by Curtis Bernhardt and written by John Kafka, who is given an original story credit on the MGM film. As Kafka wrote a number of Hollywood films during the 1940s, some of which were produced at MGM, it is unclear whether he contributed directly to Crossroads or was credited solely for his work on Carrefour. The French picture was also the basis for the 1939 British film “Dead Man’s Shoes”, directed by Thomas Bentley and starring Leslie Banks. “Crossroads” was adapted for a Lux Radio Theatre broadcast on the 29th of March 1943, starring Jean Pierre Aumont and Lana Turner. “Crossroads” was the first of two films to co-star Hedy Lamarr and William Powell. In 1935, French Diplomat David Talbot (William Powell) and his bride Lucienne (Hedy Lamarr) are enjoying their third month of marriage in Paris when Talbot is confronted by extortionist Carlos Le Duc (Vladimir Sokoloff) who demands money in exchange for not turning him in to the police. During a trial of the extortionist, whose defense is that he was seeking a repayment of debt by a former criminal comrade, Talbot is accused of being that notorious criminal. Henri Sarrou (Basil Rathbone) testifies that he is not. Talbot claims that amnesia prevents him from knowing the truth and his story is backed up by a psychologist, Dr. Tessier (Felix Bressart). Sarrou then visits Talbot at his home where we learn that Sarrou deliberately testified falsely to set up his blackmail scheme. He demands a million francs, half the loot from an alleged scheme he and Talbot (in his forgotten criminal phase) carried out. Talbot subsequently struggles to discover the truth about his past, while keeping Sarrou at bay and his wife in the dark.